We know what the ballet The Sleeping Beauty looks like and above all what it’s worth. We know it since 1890. In case the historical productions performed by Russian and English companies to this very day aren’t proof enough, then there are still the recent reconstructions of Sergei Vikharev and Alexei Ratmansky to remind the sceptics this is a timeless creation which needs very little upgrading, least of all by the wrong hands. Why on earth contemporary dance-maker Nacho Duato was asked to make a new version of the ballet will undoubtedly puzzle future generations – provided, of course, it survives the test of time. There have been contemporary adaptations and reworkings of Beauty before, but unless they headed on a radically original course, none ever came close, let alone surpassed the original as it was conceived within the Imperial Theatres in St. Petersburg by the combined talents of director Ivan Vsevolozhsky, choreographer Marius Petipa and composer Piotr Tchaikovsky. Neither does Duato’s version. Duato created his Sleeping Beauty in 2011 during his brief stint as director of the Mikhailovsky Ballet in St. Petersburg. The brave idea allegedly was to produce a Sleeping Beauty for the 21st century. Yet that turned out to be more of a fairytale than the ballet’s subject itself. If anything the production was proof that money cannot buy everything. Duato’s Beauty still presents itself as a classical ballet, albeit one that is scuttled by a basic mistrust of text, spirit and music. The result is by and large a very unhappy wedding between classical and contemporary styles. Pointework in convulsion mode; Martha Graham as princess Aurora. Forget the multilayered complexity of the original, the fairytale atmosphere, or the enchantment. With its truncated narrative, botched choreography and mutilated score, Duato’s staging doesn’t stand much of a chance. Tottering between hilarious (the Prologue variations, the nervous courtiers) and properly embarrassing (the scenes with that fearful Carabosse in drag), it doesn’t matter that echoes of Petipa ring through the key moments, Duato never finds his own voice. Worst of all, while this is one of the richest and most profound dance scores ever made, Duato does nothing with it. In short, a travesty of The Sleeping Beauty rather than the version for the 21st century. The elegantly fresh sets and pastel-tinted costumes from Angelina Atlagic run away with the honors in this production. The present release from BelAir Classiques documents a performance by the Berlin State Ballet, the company Duato is heading since 2014. By all accounts the production wasn’t well received in the German capital either, which makes its release on HD video rather bizarre. Iana Salenko and Marian Walter are excellent dancers, yet in spite of their fluent partnership they never manage to crack the ice. Neither does the rest of the cast, laboring through it all with blind devotion. They deserve better than this. Robert Reimer’s conducting is about as undramatic and bland as the activity on stage. The Orchestra of the German Opera sleepwalks through most of the score, unable to avoid some jarringly unbalanced sonorities (as in Aurora’s Variation in Act 2). For what it’s worth, the performance is agreeably filmed by Andy Sommer. The HD cameras cope well with the sometimes harsh stage lighting of the production. The sonics are impressive and detailed, if somewhat bass heavy in the DTS Master Audio 5.1 format. This release offers no bonus materials – not that we would have been craving for any. To be shelved under forgettable. Categories: Blu-ray and DVD reviews | Tags: ballet, Berlin, Berlin State Ballet, dance, Iana Salenko, Ivan Vsevolozhsky, Marian Walter, Marius Petipa, Mikhailovsky Ballet, Nacho Duato, Piotr Ilyitch Tchaikovsky, Robert Reimer, Russian ballet, St. Petersburg, Staatsballett Berlin, The Sleeping Beauty | Permalink. Unlike the Tchaikovsky ballets there is little chance that Raymonda will mean much to outsiders. Alexander Glazunov’s first ballet, created as a 3-act production at the Mariinsky Theatre in St. Petersburg in 1898 and performed by companies around the world to this day, remains nonetheless one of the finest scores in the genre. 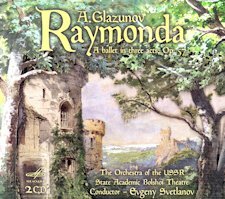 In many ways, Raymonda was continuing the trend set by Tchaikovsky, upscaling ballet music to an unsuspected level of sophistication and art, and making an essential contribution to the apotheosis of Russian Imperial Ballet at the close of the 19th century. 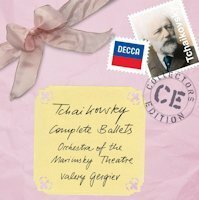 Categories: CD reviews | Tags: Alexander Glazunov, ballet, ballet music, Bolshoi Theatre Orchestra, Evgeny Svetlanov, Marc Haegeman, Melodiya, Raymonda, St. Petersburg | Permalink. Of the three Tchaikovsky ballets, Swan Lake is in spite of its ever-lasting popularity the most unfortunate. 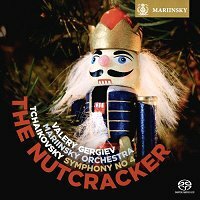 Unlike The Sleeping Beauty and The Nutcracker, Tchaikovsky’s first attempt in the genre has from the start been tampered with, not to say mutilated, and even to this day dance-makers of all talent feel free to ravish the score at will to suit their purposes. As if somebody today would alter the order and content of a Verdi or Wagner opera because that is considered an improvement. Categories: Concert reviews | Tags: ballet, ballet music, BBC Proms 2011, Kirov, London, Marc Haegeman, Nutcracker, Orchestra of the Mariinsky Theatre, Piotr Ilyitch Tchaikovsky, Royal Albert Hall, St. Petersburg, Swan Lake, Tchaikovsky, The Sleeping Beauty, Valery Gergiev | Permalink.